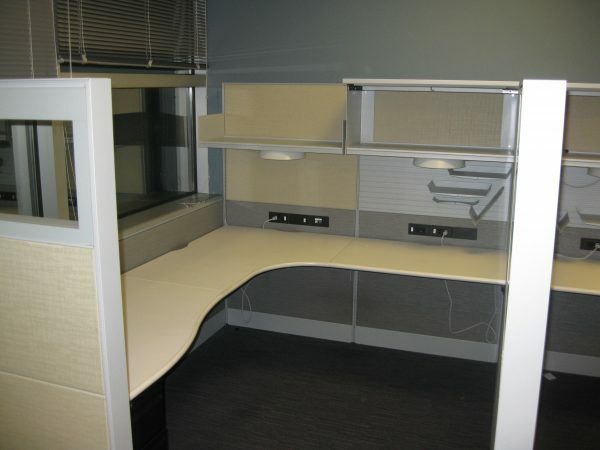 Teknion 6×8 cubicles with belt-line pwer and data! 66″ high tiled panels support a 36″ overhead shelf and 36″ overhead bin with task-lights. Tool slat-wall tile with tools. Whiteboard tile included. One BBF pedestal under curvilinear worksurfaces. Wing (closure) panel has glass at top. Power down the spine, sold in 8-packs. Product is in very good as-is condition.